We are one of Sydney’s premier fruit and vegetable providores. We offer delivery all over Sydney metro 6 days a week to restaurants, hotels and caterers. Communication is imperative to the ongoing success of our business, we have a constantly updated website and a fortnightly market review to keep you informed of changes happening in the market at all times. 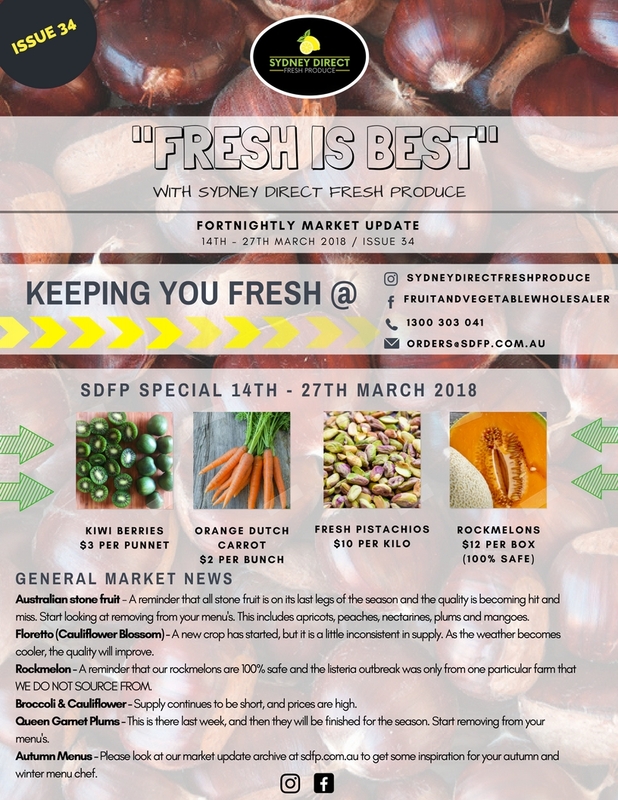 ISSUE 34 "FRESH IS BEST"
ISSUE 33 "FRESH IS BEST"
Sydney Direct Fresh Produce is a fruit and vegetable wholesaler based in Sydney. We deliver to restaurants, pubs, hotels, caterers and events all over Sydney six days a week. We pride ourselves on having the best customer service, freshest produce and competitive prices. © This material is protected by copyright under the laws of Australia and may not be used without written permission by Sydney Direct Fresh Produce.